Just like in the first Hidden Cup there were some exciting results. There was a different player making waves and advancing his way to the finals, possibly using anonymity and and preparation to their advantage. TheMax met TheViper in the grand finals and at one point was 3-1 up, only for TheViper to climb his way back to win 4-3 in tremendous fashion. Congratulations to TheViper for his incredible turn around victory, and to TheMax for winning over many fans and showing the world what he is made of on the 1v1 stage. Both players more than deserved their spot in the finals and showed their class in both the gameplay and interview afterwards. Players had a relatively pain free scheduling experience due to the timeline and structure we had in place. Since the HC2 Qualifier ran late it did delay things a bit, but all sets of matches for HC2 were completed and scheduling went well all while doing so through an admin! We did not have any issues with players sharing their identities, and the lack of ping in game did help mask things as much as possible. The prizepool split we felt was very reasonable with $3,000 for first, $2,000 for 2nd, and $1,000 for the losing semi-finalists! Even the losers in the Ro16 walk away with $100 for their time and efforts! It is particularly exciting for me to have heard feedback from the players. Not only have some players said they enjoyed playing in such a format, most players really enjoyed watching the show as they could guess just like all of the viewers. I think in both Hidden Cups Miguel & Max showed us what can be done in a format where you cannot prepare for a specific opponent ahead of time, or even know who they are during the series. Unfortunately King Alfonso (Liereyy) had a family emergency 30 minutes before his semi final on Sunday. This situation was rough all around, and in the end he ended up being replaced by Joan of Arc (Tim.) First attempt at rectifying the situation was contacting Tamerlane to see if he could play, as he was the loser to King Alfonso. He did not respond. Next we asked if the 2nd Semi final could move up and play which would give us more time to organize a solution. But one of the players had made plans for this time as they were scheduled to play around 15:30gmt. Final solution was to ask the remaining quarter-finalists to see if any would be able to play with less than 30mins notice. Luckily Joan of Arc was available, otherwise there would have been a 3 hour delay to the stream with no guarantee that Liereyy could even arrive later on that day. Obviously this was less than ideal, but it was the best solution for the timeline and circumstances. As a losing quarter-finalist Tim was set to receive $600 in prizepool. He will now receive $1,000 for stepping in as a replacement player & giving HC2 more time and effort. Liereyy will receive $1,000 despite not playing on Sunday. Fortunately I have heard that Liereyy's family member is healthy, which is really good news! From an organizational standpoint I set out to make sure that Hidden Cup 2 would be as good as possible for casters and participants. Due to the already generous prizepool amount, I really felt there was no justifiable reason to require casters to pay for access or hold back others from participating in the event with their own channels. Additionally, every banner color that we created for other channels was utilized throughout HC2, which really fit their overlays more and made it a better experience for their audiences! I've received quite a few messages from the english and spanish community on their appreciation of these things which means a lot because I felt strongly about it. Hidden Cup 2 had over 20,000 people watching live on the final day across all channels. 18,000 on Twitch, and well over 2,000 viewers on Youtube. I'm not certain but I think this is a record for AoE2! This number makes me incredibly proud!! From a personal standpoint I really was hoping to break 10,000 viewers organically. It sounds like a ridiculous number to even set out to achieve, but I felt like it was doable with a plan in place. I put a lot of effort into engaging newcomers to the game and making Hidden Cup 2 appealing and approachable for them. Capture Age certainly helped add excitement, and present the game in a new way. I thought that maybe with a lot of work 10,000 could be reached, but it was impossible to know what to expect. Here is the breakdown of the viewer highs for each day of Hidden Cup 2. Those numbers are still hard to process for me at this time. To hit 17,690 organically was never even fathomable. All I can say is, I am grateful and proud to have been able to present the beautiful game to so many. Capture Age was incredible to cast with and definitely elevated Hidden Cup 2. The team worked to test CA with me, create a dozen or so versions for me, and format CA to bring it to what you saw during Hidden Cup 2. There was a lot of testing and tweaks that were made in the weeks, days, and hours leading up to HC2. I know the team is very pleased with the community's impression of it and are looking forward to expanding the project further. The Guessing Competition data is very interesting! Over 2,000 people guessed player identities before the reveal. 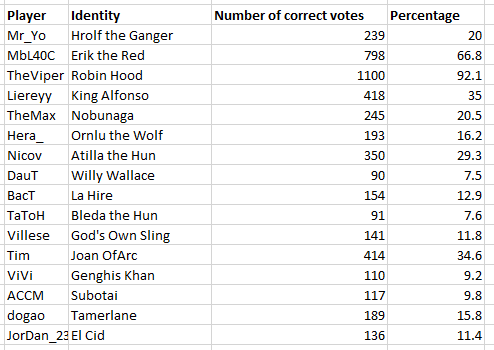 TheViper was guessed the most accurately with 93% placing him as Robin Hood. MbL was right after him and was guessed correctly by 60% of participants. After that though people didn't seem very sure, with Mr_Yo, TheMax, Bact, TaToH, Villese, dogao, DauT, ACCM, and Jordan_23 all being guessed 20% of the time or less. DauT was correctly guessed the least (7.5%) so he will receive $100 as his prize for hiding his identity. I have to say, I never expected DauT to win that one! While many experienced players and casters might have been more accurate, the bulk of viewership was really undecided on many of these identities. This was the goal going into the event and it added so much enjoyment on top of the actual matches. It is particularly exciting to see the 2nd place player surprise so many by making it to the final (19% guessed his identity). 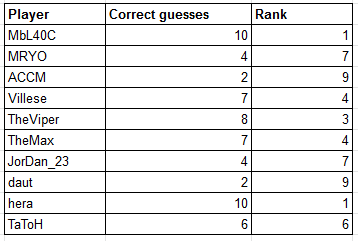 Nine people tied for 1st place in the guessing competition with only 11/16 identities guessed correctly! Perhaps even more surprising, here are the results when the pro players tried to guess all identities they witnessed in the event! The Bracket Competition was purely luck, but the top 3 winners will also be receiving awards for their obviously "calculated" brackets. I admit I am slightly jealous because my bracket was garbage from the start . An event like this doesn't happen with one or two people and there are so many to thank. First, thanks to the community for their constructive feedback. The idea to incorporate hero names came from many who might be reading this, as did some of the tweaks to the qualifier. Thanks to Microsoft, LeglessAlex, and my community for the awesome prizepool contributions. Thank you to the players for scheduling on time, playing with integrity, and keeping their identities to themselves (for the most part..."U NO ME???") Thanks to the CaptureAge team for the long hours and help to make this happen. Thanks to Robo and BaronUKF for adminning and running the show. Thanks to Henkdesupernerd and Algernon for the HC2 mappack work. Thanks to 4Hardy for video editing. Thanks to Grimgerbil for the guessing competition. Thanks to Slam & Dave for cocasting with me during those long streams. Thanks to everyone who enjoyed Hidden Cup 2 and made history. This was an amazing tournament to watch and take part in. I wish I could have supported as much as some of the crazy donators did. To be completely honest, all your streams from now on will look amateur in comparison to that. The overlays, CaptureAge, the games themselves. Still salty about Joan screwing my bracket picks not once, but TWICE. I was even Rank1 on the bracket after Day 3. But that's fine! I can't wait for HC3. Congratulations on the insane viewer and subscription records. You deserve those and much more. It was very confusing for me to see the Nick "Tamerlane" which is actually a real nick of a different player. Maybe next time just use fantasy nicks for every player. This was great. A huge thank you to everybody who made it happen! Are you saying Willy Wallace was supposed to be William Wallace? Only one thing I would do differently, maybe start 1 day earlier and do the final in one day separated, having to play a semi final is stressful enough to kill the rest of your day, imagine having to play a semi final and a final with a 15 mins break between both series, viper's head probably was gged (mine at least would). Also, with the final alone in one day you still can build a bit more of hype for the tournament I think. Thanks for the input dogao. Trust me, had I known time would have stretched on for so long on the final day I would have had the semi finals be recs as well. This would mean less wait period between games for casters & viewers, and also that finalists would be in better shape for the live final. It'll be considered for the future, great performances my friend! Glad to have you back playing at a high level. Fantastic tournament all around man - you totally deserved the crazy viewership you got! Obviously the whole event was quite a marathon, but everybody seemed to be having a really good time. Agree with dogao on alterations you can make for future events, but such critiques are quite minor compared to how streamlined and well-presented the tournament was. Didn't get to see much of capture age as I was casting myself, but I did check some of the VoDs and it looked really interesting! You can tell those guys put a ton of effort in to it. Obviously congrats to TheMax as well for such a strong performance (even though I thought he was Tati 11), but Viper really proved how freaking resilient he is as a player. Lastly, gotta shout out both robo and baron who did an excellent job keeping the show running smoothly! Thanks Ornlu, glad you were able to take part and enjoyed it! "Ornlu is the most OP hero unit." I think it's time to change your aoezone signature now. Amazing tourney, casting, map selection and players performance. Also breaking the 17K viewers is just fantastic. Who would imagine this two years ago? And the streaming reached a new level with the Capture Age experience. Brilliant tool. I would like to add my congrats on an amazingly entertaining tournament. I had forgotten about AOE for many years until about 8 months ago I stumbled upon a YouTube video from a small time caster named T90 :-). To see what has been accomplished in those months is quite amazing to me and I look forward to many more tournaments and great quality play. While I will likely always be a fan of "the snek", Mbl and Tati, I have a new player to follow now too. Congrats to TheMax for a stupendous performance and near dethroning of the king! Is there a chance of a team edition of this? For example 2v2 maybe? we did a smurf tournament on nC years ago, you didnt even know who was your teammate. Was lots of fun! 2v2 and not knowing your teammate would be hilarious 11 but it seems pretty hard to organize at the pro level. I thoroughly enjoyed it, although the ending was a bit anti-climatic. TheMax had a fairly easy way to the finals(Im not saying he's not a good player, but lets face it, Tim's not Liereyy) and im sure the little time Viper had to rest between semi and final was not enough, and that made him underperform. If not mistaken the same thing happened to Mbl last year but, unluckly for him, he didnt face TheMax at the finals. So i think the semis and finals schedule should be changed.Certainly a more flexible one would help with unfortunate events such as Liereyy's . It may also make it easier for viewers to follow since some of us might not be able to binge watch the stream 8 hours straight. I'll just leave this here: KingAlfonso vs Nobunaga Showmatch. It was very confusing for me to see the Nick "Tamerlane"
and did you recover or still confused? Some players identity were guessed by checking the game language, it was funny.